You save $59.05 Over 60% saving! Rotor head for precision and smooth movements. Using Ball and Hiller two systems mixing control. Through simple structure of Ball control system, power-saving of Hiller system and CCPM control, can simultaneously control 3 servo for AILE, EVLE, PIT 3 actions. This control system is great for 3D flying control and extending life cycle of servos. 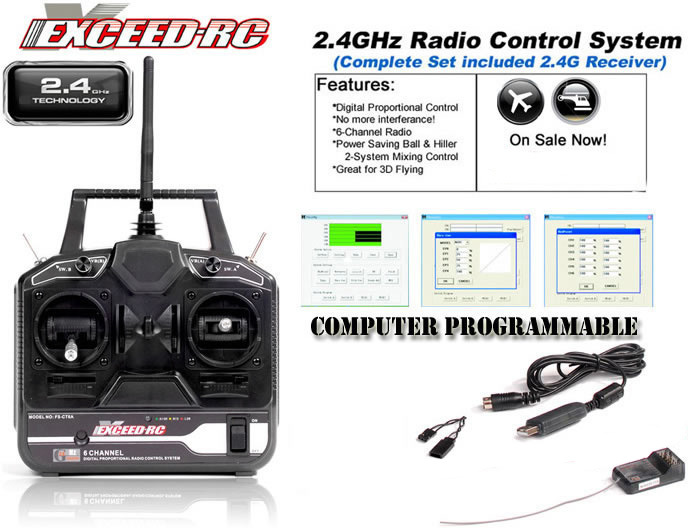 This 2.4G radio system is the ultimate choice for beginners. Great quality, Super long range. Can remotely control airplane and helicopter without interferance. "5" "Mike from ohio" "March 3, 2016" "This system is easy to use and does the job well. Great bargain for the price. A+ from this avid hobbyist." "5" "Mark" "March 26, 2014" "Bought this primarily for the sliding trim levers as I don't like pushing buttons for trim like on newer radios (which I have). Also don't want my radio to fly the plane so didn't need the onboard computer stuff. Price was great on this system. Did take a bit of effort to get driver to install but my fault. Setting up ch 5 and 6 to function for planes was somewhat challenging but got help from You Tube video. Am very happy with this purchase. Recommend a cheat sheet of some sort to help setting up ch 5 and 6 though. All in all this system gets 5 stars for price and quality." "5" "Brian Percival" "July 7, 2012" "I have owned this radio for 2 years now, has been in several planes and a boat. Had crashed a Super Cub, the components survived, the plane did not. This radio can take a lot of punishment and still survives. No problems with software to program it. 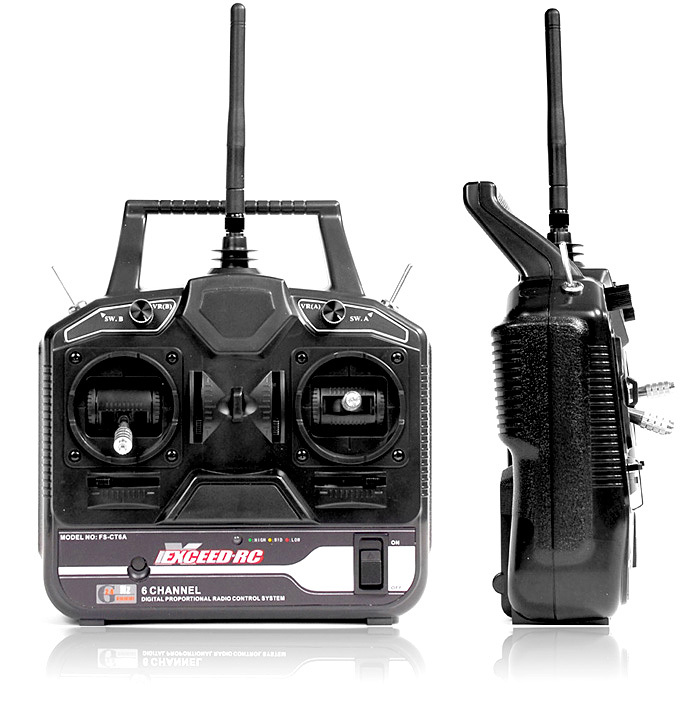 Have used this radio along with Phoenix Simulator, works very well. For this price, I will buy another." "3" "Timmy Claiborne" "September 27, 2011" "I have had it for about 1 year and it has been a good radio for the price but i now use a Asus laptop and the usb does not recognize the adapter to program the radio but it did work fine on HP computer not sure why but it's a pain. oh well" "5" "Sam" "July 9, 2011" "Very happy with mine, have table-top tested it and seems to work very well. I needed the 6 Ch so I could use one Ch for flaps on the one servo system used in the TeleMaster 40. 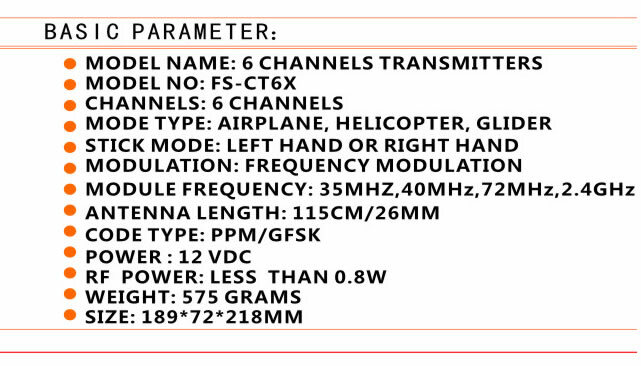 Have read that the range of transmitter and receiver in this package is more than good enough!! (So is the price)!!" "5" "crash13" "May 20, 2011" "i'm making a vtol tricopter and i was wondering if i can program it so when i flip a switch my elevator,rudder,and my airelon servos switch to three motors for vtol landing. thanks" "5" "Pawaka" "May 8, 2011" "I bought this Tx in late 2009. I have had issues with linking Tx with the Rx. It would take about 2 min and 16 seconds to establish a connection with the Rx. Contacted the tech support but no help. Today, I wanted to fly my new scratch built foamy but the Tx is simply not linking with the Rx. Disappointed that it did not work out for me. Well I am contemplating on buying HK from HK. Just wondering, can I use the Exceed RC Rx with HK Tx?" "5" "oXieee" "January 14, 2011" "does it have flaperons?? ?Please tel me b4 i buy this. What is the other little piece with the Rx. Also what is the diffrence b/w this and http://www.hobbypartz.com/79p-ct6b-r6b-radiosystem.html. which 1 should i buy? ?they both are the same but renamed. Please suggest." "5" "David" "December 26, 2010" "This is a good radio for my PT-40" "5" "michele" "December 13, 2010" "Like the product. Very easy to use and adaptable." "5" "Charles D" "November 2, 2010" "Why spend $300 on a radio system that you really can't understand. i decided to purchase this set because it does what I need a TX to do.. Most EFFORTABLE Jets/planes don't need or even use 8Ch's so why bother. 5 Stars for this item." "5" "donnylove" "October 28, 2010" "heres Mix Num: MIX 1 Source: CH1 Des: CH2 Up Rate: 100 Down Rate: 100 Switch: ON Mix Num: MIX 2 Source: CH2 Des: CH1 Up Rate: -100 Down Rate: -100 Switch: ON Mix Num: MIX 3 Source: VR B Des: CH5 Up Rate: 100 Down Rate: 100 Switch: ON You now have basic elevons, with Channel 1 as your left elevon, and channel 2 as your right elevon. Channel 3 is your throttle, and Channel 4 is your rudder. And you have Channel 5 controlled by VR B for gear or bomb doors, if you like. elevon mix setup-" "5" "RON HILL" "October 24, 2010" "LOVE IT !!! LOVE THE PRICE !!!! WILL BE BUYING MORE !!!! WORKS GREAT !!!!" "5" "Jim Rippy" "October 17, 2010" "Radio works flawlessly. Love being able to program with laptop. Did not come with software or manual, but found what I needed online. You are not going to beat it for the price." "5" "Stephen Wuest" "September 22, 2010" "The price is right, and I have not had any problems with the radio. I could not get the programming software to work, so tried DigitalRadio.exe. This software works fine for probramming the radio. Pay the $1 to register the software. I am pleased that the RX works with a separate SBEC. Plug the SBEC into the BAT slot and attach the battery, before you plug in the ESC battery. I am using a 3S with a Turnigy SBEC 5-7A." "5" "F. Koebke" "August 26, 2010" "Very good TX for the money. Easy Google search to find the T6 config software and usb driver. Installed under vista or Win 7 is best. PDF format manual was also easy to find. Follow links here or from Xheli.com." "4" "Alan Blankenship" "August 16, 2010" "The radio works flawlessly, there is very little I would change about it. I have seen no glitches and perfect control. The usb cable that connects the radio to the computer is the downside to this setup. The connection is consistantly unstable. It usually takes about 30 minutes of uninstalling the drivers, restarting the computer, reinstall the drivers, before I can program the radio. I don't need to program that often so not too big of a downside." "4" "the#1" "August 1, 2010" "This radio seems to work as it should, but the box had absolutely no documentation or software in it. It does come with a functional programming cable though, and it seems to have a rock solid signal once it's connected. 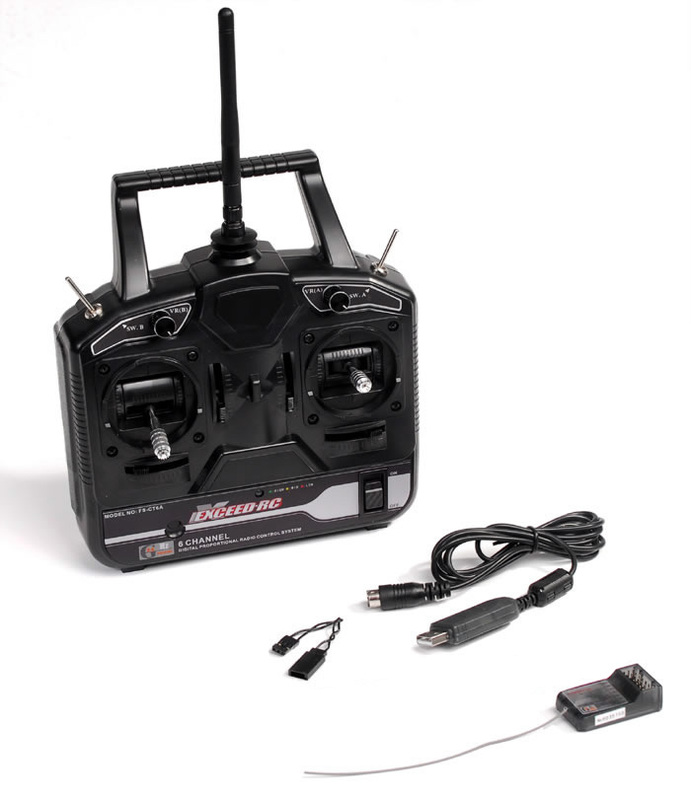 I'll be recommending my nephews to get this radio since they're getting hooked on RC flight too!" "5" "Bob Hed" "July 10, 2010" "The package should have a sheet explaning how to get the manual and set up the system. Other than that it rates 5 stars." "5" "Ken Marx" "June 17, 2010" "Very pleased with this TX. You can do everything you want to via the USB link. I have even set Differencial as follows. Aileron Differential: Mix 1 Set up. Source: CH 1 Des: CH 6 Up Rate: 100% Down Rate: 100% Switch: On Step 2: Reverse CH 6 Step 3 Adjust end point: CH 1 Set Left side at 100% and Right side at +_ 60% Set Destination: CH 6 REMEMBER THIS OUT PUT IS REVERST. Left side set at +_ 60% and right side at 100%" "5" "Nick" "June 16, 2010" "This is a great Product for six channels at 2.4GHz and for 45 dollars. The only difficulty I found was the software, make sure you follow directions, don't skip ahead or you will be lost and it will take you hours to get the setting back to normal. ( SAVE your work) GREAT DEAL" "5" "denis" "June 16, 2010" "really goog im going to buy some more" "5" "robert kress" "June 11, 2010" "this is a great transmitter for the money. it likes to eat batteries but i replaced the 8 AA `s with one lipo pack and it last for ever now." "4" "Jon" "June 11, 2010" "If you know what you're doing in RC, this is a very good value. Lack of a good instruction manual and really basic programming will make this tough for a beginner....but if you know your way around transmitters and recievers...you can't beat the price." "3" "Ken Marx" "June 5, 2010" "Not bad, it works fine. The CD would DEFFINETLY HAVE HELPED. Price is amazing. Sticks are possibly the best I have used, Smooth. Once you have it linked to your PG you can turn it inside out. Must make the BIG RC equipment boys cry. I am very gratefull to the chaps that loaded all the info that should have been on the CD and don't forget the USB UART driver. The lost strars are due to many hours spent hunting down software, manual and USB driver. Happy flying, Ken." "1" "Wm" "June 3, 2010" "This is my second Exceed unit. I also have 3 Brand name TX's with 6 rx's. This sysyem works great, in some pretty dense electronic environments too. About the onlyt it can't do is to mix for delta wing set ups. I will be purchasing another before too long." "5" "Benas" "May 18, 2010" "I have question: Mode2 & Mode1 is programable? Or are diferents systems??" "5" "Ron" "April 23, 2010" "Takes a lot of time to set up, when I finally got it running, it only lasted about 10 minutes. Glad I didn't put it in an airplane.!" "4" "Marc" "April 16, 2010" "The transmitter is solid enough and works well. There is good range. The programming is not the most intuitive but works well enough. I use it for plane and wish there were better mixing. If you want channel 5 or 6 to do anything you need to use one of only three mixers to make it work. So for a complex sailplane not the best. For small aerobatic plane good enough. Know nothing about heli's so can't help there. As far as not having manual switching for servo reverse: call me funny but I make sure my plane is setup correctly for throws before I head to the field for the first time and then they don't change. So having manual switches seems no worth while. overall good value" "5" "Bob S." "March 17, 2010" "I'm a complete first timer. Built a plane from a balsa kit. Wrecked it twice. Now it flies great and the TX/RX has worked fine. The computer program interface is clearly translated, as is the manual. It does consume AA's. If you buy it, look for help on the web and you'll be fine." "5" "Mallory" "March 15, 2010" "I love this transmitter!!!! !2.4Ghz Rocks the house,Great range you can fly out of sight,once i got the hang of programing it all is good.Remeber nothing is good unless you play with it!!!!! !Make sure you have everything set up befor you go fly if you dont have a laptop.Great price to thanks guys!!!!!!!!" "4" "Timmy Claiborne" "March 2, 2010" "i ordered it from hobbypartz.xom and i did not get the CD that was suppose to come with it.WTF man" "3" "Travis" "February 24, 2010" "The radio is great, but it doesn't come with the programming CD. :(" "5" "Timothy" "January 17, 2010" "Great transmitter! Smooth sticks, good signal, great price, and once you get the hang of the programming software it is easy to set up. But!, I agree with the guy below, if you don't have a laptop like me and you have to make adustments at the feild, you're screwed! So it would be nice to have some manual reverse switches on the transmitter somewhere." "5" "rocky walker" "January 6, 2010" "5 stars for exceed .doesn�t break your bank and Does most all the functions of the big boys can do. the only thing i dont like is it eats batterys." "4" "John Hook" "December 8, 2009" "Great system, works well, no range problems compared to a Hitec. BUT.. and there is one issue. To change anything like reverse a servo, you have to hook up your laptop and use the software. Test your settings, direction, expo, throw etc at home well. Even so, I take my netbook out to the flying field to make any adjustments. Otherwise a GREAT DEAL !" "4" "Tyler" "November 8, 2009" "It Feels a little clunky, like if you drop it; it will shatter into a dozen peaces. For the price tho, wont be that sad if it does break." "5" "Tim Tusasky" "October 11, 2009" "For $44.95, I was in doubt about how good this thing can be but boy was I wrong! This radio system is totally awesome and the signal has been flawless! Control is smooth and easy. I use it on my 3d heli and airplane and it has been great. You guys need to keep more receiver in stock because i got so much things to fly now!!! thank you for the good deal." "5" "Jerry" "September 9, 2009" "It's all you hoped it would be and more. does almost everything the "big boys" do, but doesn't bankrupt you. At the field, you'll be the topic of conversation as the old timers watch and then admit it's a super system." "5" "Jerry" "August 24, 2009" "It's everything you hoped for and more. Does most all the functions of the big boys, but doesn't break your bank! Worht the money OH YEAH!" "5" "Marc" "May 11, 2009" "Its an awesome Tx at an awesome price. If you want a 2.4Ghz Transmitter that is completely programmable, but don't have or want to spend $200, then this Tx is for you. Search "Nuttcaze" on youtube for some videos about this Tx." "5" "josh" "April 2, 2009" "5 stars for exceed rc, ya baby"
Fly Sky CT6B 6-Ch 2.4Ghz Radio Remote Transmitter w/ Receiver * Brand New Complete Exceed RC OEM Remote System55March 3, 2016This system is easy to use and does the job well. Great bargain for the price. A+ from this avid hobbyist.